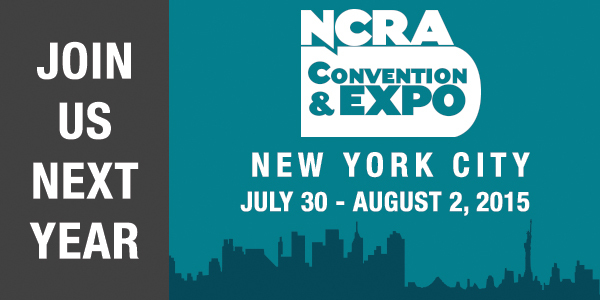 The largest annual gathering of court reporters, captioners, CART providers, scopists, legal videographers, trial presenters, and other legal services professionals, the 2015 NCRA Convention & Expo will offer a wide range of continuing education seminars, social events, and networking opportunities. It’s also where the biggest happenings in the industry take place, from the installation of our new NCRA President, Officers, Directors, and Fellows to the presentation of major awards and recognition. Mark your calendar now to attend, and you’ll see why NCRA members come together for this event year after year.